Castlederg based metal fabrication specialists Sayers Engineering are a business whose growth over the last 14 years knows no bounds. Established in 2004 by Gareth Sayers, what started off as a part time one man enterprise is now one of the most thriving rural businesses in the Derry City and Strabane District Council area, employing over 30 people and based across two sites. The ever expanding company are experts in mild steel, stainless steel and aluminium engineering and fabricate products to suit a wide range or requirements and their products include stainless steel tanks, cat walks, hand rails and processed pipe work. Having grown up on his family’s farm, Gareth built up years of first-hand experience in engineering at home making and repairing machinery. After a few years of doing metal work and farming equipment jobs on the side it became clear to him that the demand existed locally for a full time service. “I was brought up on a farm and I discovered very quickly that if you worked at fixing machinery you didn’t have to go out and feed the pigs,” he laughed. “As I got older I started to work full time with an engineering company but I was doing small agricultural repairs on the side. The jobs were increasing and after four or five years of juggling my job and the repairs I could see that the work was there for me to go out on my own full time. Word of Gareth’s high quality and dependable service travelled fast and, with the orders piling up, it was clear that he needed a bigger team around him to meet demand. “The business grew quite quickly,” he recalled. “The demand was already there and a combination of existing customers returning and new customers finding out about our services meant the orders were increasing and I had to start employing people. “Castlederg is a small area but when customers came to me once they always came back and that loyal customer base was important to the success of the business. “Every year the business grows by between 10 and 15%, it went down to around 5% during the economic downturn a few years ago but it was still growing and it is back to around 15% now. 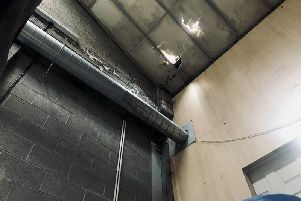 “We’ve moved the business from agricultural to industrial buildings in Castlederg and we recently moved into a second premises in the town to help us meet demand because we didn’t want to have to turn away work. A Rural Development Grant allowed us to buy a number of new state of the art pieces of equipment including a laser cutter which has been a massive boost to our efficiency and has allowed us to cut metal with extreme precision at a lower cost. While the demand clearly exists for Sayers Engineering’s services, it was Gareth’s dedication to always meet customer deadlines coupled with an ambition to keep growing the business that has seen it thrive. “I didn’t have to do a lot of market research when I set up as the demand was there already but I had to work on building a strong team who could meet the demand as it increased,” he recalled, “My role has changed as the business has grown, as the team got larger it is now more people management focused rather than working on the floor. Working by myself was easier but the rewards were greater if I could grow the business. For more information on Sayers Engineering’s products and services contact Gareth directly on 07734230299. Derry City and Strabane District Council’s Business Support Services team offer a range of services designed to help start-ups and SMEs grow. For start-ups, the Go For It Programme is now delivered by your local Council, if you have a business idea that you would like to develop, they can help you with business planning to take the next step, Further information is available on 0800 027 0639 or visit www.goforitni.com. If you are an established business within the Derry and Strabane Council area, Council have a range of strategies aimed at business growth from outdoor trading opportunities to establishing collaborative working networks we will be happy to tailor these to your business. Initiatives designed by our Business Development Team include: Business Boost Programme, Strabane BID, Market Trading Opportunities, Collaborative Networks. Please get in touch with one of our business advisors now to see how we can help with your business growth. Whether you are a start up with a business idea or an established business looking to grow, contact one of our team now to see how we can help. Full details are available at www.derrystrabane.com/business.